I was crazy about author Mo Willem's pigeon character in his hilarious (and extremely good for contrary kids who love to shout "NO" on every page) book DON'T LET THE PIGEON DRIVE THE BUS. (The sequel, THE PIGEON FINDS A HOT DOG, was equally funny, if not as interactive.) 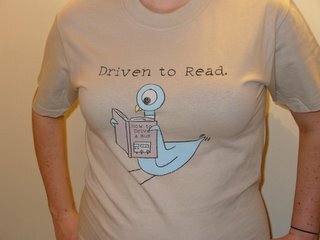 Now here he is becoming a spokesbird for literacy! The book he's holding is called, of course, HOW TO DRIVE A BUS. 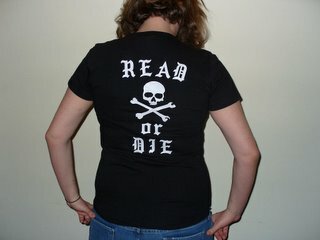 I find I'm less self-conscious wearing it when I'm not actually working at the bookstore... facing customers all day in a shirt that seems to imply that its literate inhabitant considers herself quite the hottie can be a tad embarrassing. But I love this shirt, and I wear it with pride when walking around in Brooklyn and not in such constant face-to-face contact. I realized after the fact that the goth font and rockin' design were totally inspired by the cover of Anne Thomas Soffee's book NERD GIRL ROCKS PARADISE CITY (Chicago Review Press), a memoir of her years as a music reviewer in '80s L.A. I should probably rip out the collar to make it look a little more punk... but I do intend to wear this one to work. I just hope nobody is freaked out by militant book loving.